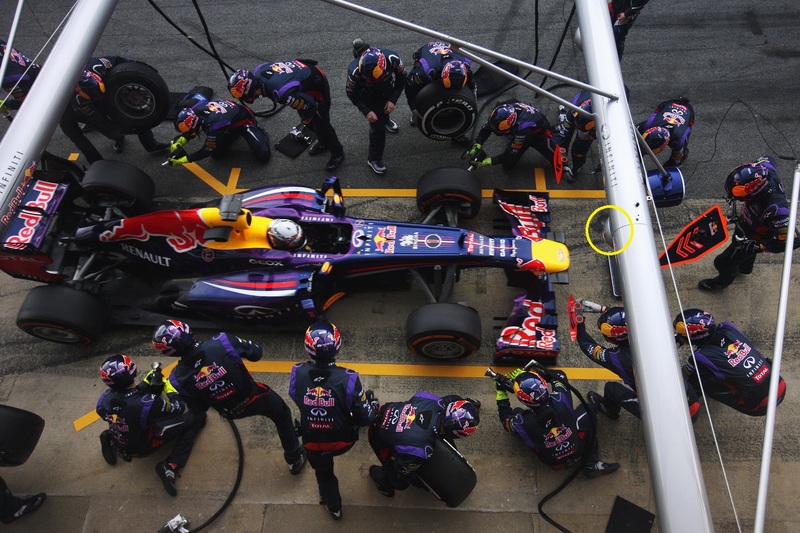 Red Bull – and all of the top teams at least – can measure the stationary time of their car using cameras placed on the boom(s) of the pitbox, hence why they were able to proudly announce their ‘world record’. Now that we’ve mentioned it, let’s start with the boom. In lower formulae and GT racing, teams will have one boom to accommodate the hoses for the pneumatic wheel guns so the crew on the opposite side of the car away from the garage don’t have to loop it over the car and cause a bit of a mess. 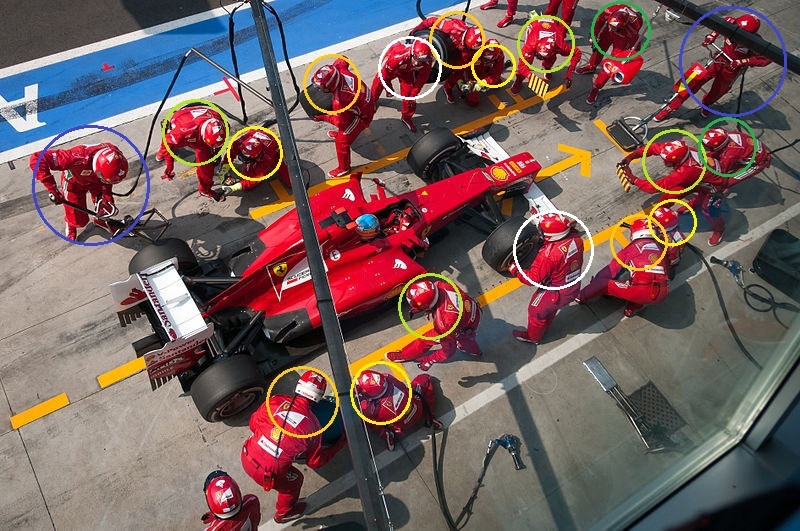 In F1 the teams have a full pitcrew and it gets a bit crowded so teams use two booms – one for the front wheel gun and one for the rear wheel gun.The booms are also the mounting points for the traffic light system and, as highlighted in the image above, the aforementioned cameras. The cameras are used to observe other details which can be analysed by the team before making changes to improve the efficiency of the ‘stop. Now that we know the function of the booms, we can delve into the role of each member of the 18 (although there are 21 in total ready for action) man pit crew and what equipment they have on them. The best place to start is from the front where we have the front jack man plus a reserve jack man ready with his jack if needed. The front jack is a very advanced piece of kit these days with many teams investing in carbon fibre construction, high end mountain bike parts and pivoting mechanisms in order to create the fastest car lifting device in the world. Depending on the height and preferences of the front jack man, he can even choose the handlebar’s width and rise to suit his leverage capabilities. To help the driver slot into the centre of the pitbox, the front jack man will line up the jack on a marker as the car enters the pitbox whilst the driver picks his spot with the help of a large (and often fluorescent) arrow pointing downwards on the jack itself. The entire length of the arrow is often in the driver’s eyeline so he can place the nose as carefully as possible to the middle of the pitbox. Once the car is up (with the aid of the rear jack man) the front jack man can then move to the side of the car using the pivot mechanism installed. The lift pad and wheels of the jack are independent of the upper section which is allowed to freely rotate around a pivot. Typically the jack pivots along a horseshoe-shaped track rather than aimlessly through the air to keep things smooth. As he moves to the side of the car the jack man holds a mechanically linked lever (mountain bike mechanical brake levers are used), which maintains the lifting pad’s position, as he waits for the car to be serviced. Once the new tyres have been fitted the jack man releases the lever so the front of the car is free to drop, before pulling the jack out of the way as the car exits the pitbox. At the same time, the rear jack man has to be perfectly in sync. His jack is not as fancy as his front man’s counterpart but they still feature a release mechanism (rather than pushing up on the jack and wasting fractions of a second) and are often made from either aluminium or carbon fibre. The rear jack man’s job is a little trickier as he has to run in as the car enters the pitbox and scoop up the rear of the car from the underside of the rear crash structure – just behind the rain light. In years gone by a small hook would hang beneath the rear crash structure for the jack to latch on to but, to save time, the lifting pad on the rear jack is now a moulded piece of carbon fibre that is shaped around the crash structure, with only a small stop to prevent the lifting pad from going too far towards the front of the car. The wheel gun man’s job is simple but very difficult to perfect. 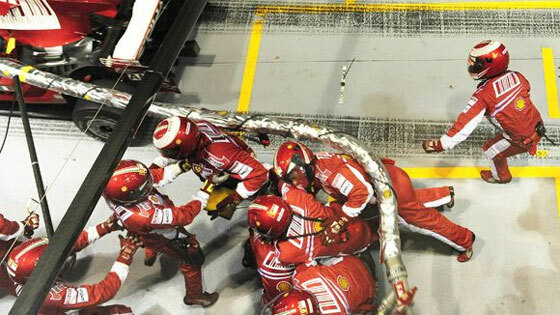 He has to track the car into the pitbox and get the gun onto the wheelnut even before the car is completely to a hault. He also has to follow the new wheel on as closely as possible so he can instantly start tightening the nut. Two trigger pulls and a reverse torque change to his gun later he can then breathe a sigh of relief. And this is when the car has stopped on its marks. The driver is tasked to line the car up in the middle of the pitbox and on the marks provided to ensure that the mechanics don’t have to move position in order to perform their pitstop. If the driver brakes too early he will often stop before his marks, shuffling everyone backwards. However because they often come barreling in at full pelt, most drivers tend to overshoot their marks (sometimes by as much as 10 centimetres) so everyone has to shuffle forwards. The wheel gun man always has a spare gun plus a spare nut in case of a disaster. I’m not sure how difficult it is to cross thread an F1 wheelnut but I’d be terrified of messing it up! The wheel off man acts as another guide for the driver on the way into the pitbox as he either has a board or a fluorescent back to his glove which he holds above the marks at the height of the wheel. This allows the driver to brake closer to his marks as he can align the tops of the tyres (the only visible part of the wheels the driver can see) with the board/glove. The wheel off man then moves on to dispatching the old tyre, pulling the wheel off as the wheel gun goes to work. Once he has dumped the old tyre he can then get on to checking the brake ducts for debris. Getting the next tyre on is tricky and timing is crucial. Three people around one wheel must be difficult to choreograph, which is why they spend so much time practicing. The wheel on man has to get the new tyre on as soon as the last part of the outgoing wheel is clear, squeezing in front of the wheel gun man in the process. It’s fiddly, especially in all their gear, but that’s why they are paid to do it as part of their job. These guys will often check the sidepods and bargeboard area for any debris or marbles that intervene with the airflow. This is after they have helped the jack men by grabbing inside of the sidepod inlet and airbox and hoisting the car up more speedily. It is the masses of small details which reduce chunks of time and these two men are two more pieces in the puzzle. The two men at the front of the car have three tools to service the car for any of three scenarios – a front wing flap adjust, cleaning slot gaps or replacing the entire nose/front wing assembly. The flaps are adjusted using a small drill which slots into a tiny pod on the front wing. The drill’s trigger is preset to the equivalent of, say, 1 degree, so one trigger pull is one degree of front wing – one turn. The driver can request as many turns of front wing as they like, up or down (unless they are already running maximum or minimum wing angle), for their pitstop although they often have a set strategy during the race as the fuel load comes down and the balance of the car changes. Small brushes are used to clear any debris (often marbles) from the front wing’s slot gaps, as these allow consistent front downforce to be generated across a large speed threshold. To change the nose, the front wing servicemen carry an Allen key of some description which can free the front wing assembly from the chassis, ready for a new one to replace it with. Once all four tyres have been replaced the car is dropped and one from each of the wheel crew raises his arm to confirm that their task is complete. A man overlooking the entire pitstop stands in front of the car with a view of the pitlane holding a switchboard. He can then release the car via the traffic light system if it is safe to do so or he can even change it back to red if there is a problem. In years gone by each jack man and wheel gun man had a button that, when everyone had pressed, would automatically cue the green light. However after a series of unsafe releases this was changed to the aforementioned system on safety grounds, and to be honest it probably works better as the mechanics can focus on their job properly rather than rushing to press a button. It is then up to the driver to react to the lights to complete the pitstop. Spare wheel nut ? Isn’t everyone using built in nuts ? Not as far as I’m aware of. The teams have a nut that’s threaded on and retained by about four pins. When the gun goes on the pins are pushed down and the nut can be undone. The nut is then sandwiched into the gun to prevent it falling away during the tyre change. It’s crazy that the wheel man has to have the wheel gun in place on the vehicle before it has even come to a stop. I would imagine that this is probably one of the more dangerous parts of the job because you could easily overstep and have your foot run over or something like that. It would be pretty cool to be able to use one of those wheel guns though.